DICE, an Electronic Arts Inc. (NASDAQ: EA) studio, announced Battlefield™ 1. Only in Battlefield 1 will you bring a horse to a tank fight and squad-up with your allies in epic multiplayer battles with up to 64 players. Through ever-changing environments at the dawn of all-out war, no battle is ever the same. Battlefield 1 will launch on October 21st, 2016 Worldwide on Xbox One, Origin™ for PC and PlayStation®4. Battlefield 1 takes you across multiple and varied locations in a bid to fight your way through immersive battles. From tight urban fights in a besieged French city, to big open spaces in the Italian Alps and frantic combats in the deserts of Arabia, discover a world at war through an adventure-filled campaign. 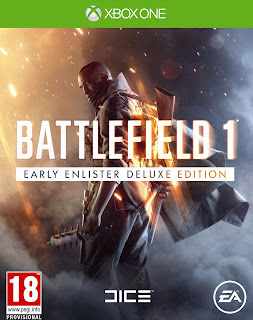 “The game will deliver a fresh experience full of what makes Battlefield great, with a multiplayer sandbox, immersion, epic scale, authenticity, team play and an ever-changing world full of unexpected Battlefield moments,“ said Aleksander Grøndal, Senior Producer, DICE. “We’re inviting players on an epic journey across a war-torn world, taking them to the Great War and providing something both varied and unique in Battlefield 1.” Set against the backdrop of World War 1, witness the birth of modern warfare, as the Great War saw a furious arms race with new machines and weapons created to get the upper hand during the most technologically divergent war of all time. Feel the intensity and immersion as Battlefield 1 takes advantage of this modern arsenal to deliver the experience fans love, but with a fresh and modern twist. Watch the first look of Battlefield 1 on https://www.youtube.com/watch?v=W-yhXFxql6o, and discover more on the future of Battlefield at www.battlefield.com/en-gb/ . Fans can also sign up to become a Battlefield Insider http://www.battlefield.com/en-gb/community/insider . Get early access to the Battlefield 1 public beta, in-game rewards, exclusive content and sneak peeks at news about Battlefield (plus news about other EA games, services, and events). Battlefield 1 will launch on October 21st, 2016 - Worldwide on Xbox One, Origin™ for PC and PlayStation®4. EA Access and Origin Access members can play Battlefield 1 for a limited time before launch with Play First Trials. EA Access members receive a 10% discount when they purchase a digital version of the game on Xbox Live, and Origin Access members get a 10% discount when they purchase the game through Origin*. Join the Battlefield conversation on Facebook, YouTube, and Twitter®.